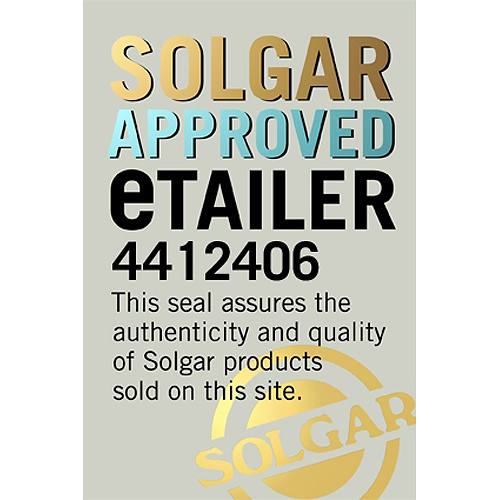 Solgar® Super Cod Liver Oil Complex Softgels is a formula rich in essential fatty acids and Vitamin A and Vitamin D. The product is derived from deep-sea, cold-water fish and has been molecularly distilled to remove harmful contaminants. 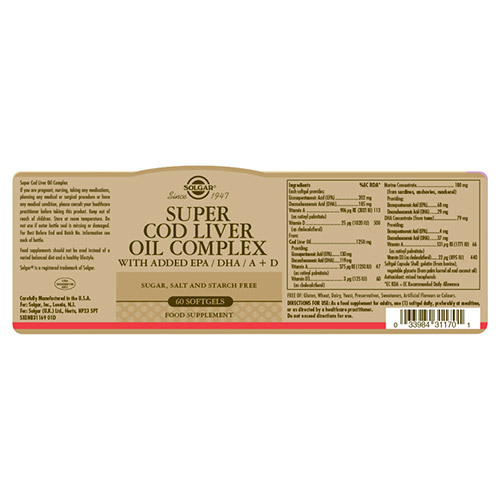 Cod liver is a rich source of essential vitamins including Vitamin A and D, as well as fatty acids. Vitamin D is a fat-soluble vitamin that supports optimal wellbeing, the benefits of the “sunshine vitamin” are numerous and well documented, but particularly for immune health. With over a billion people worldwide with very low levels of vitamin D, in addition to changing your diet and lifestyle, taking a vitamin D supplement is a good way to top up. By taking 1 softgel of Solgar® Super Cod Liver Oil Complex a day, you will nourish your body with the powerful combination of Cod Liver Oil, Vitamin A and Vitamin D.
Softgel Capsule Shell: gelatin (from bovine), vegetable glycerin (from palm kernel oil and coconut oil) Antioxidant: mixed tocopherols, EPA, DHA, Vitamin A (as retinyl palmitate, Vitamin D (as cholecalciferol), Cod Liver Oil, Vitamin D3 (as cholecalciferol), Marine Concentrate (from sardines, anchovies, mackerel). As a food supplement for adults one softgel daily, preferably at mealtimes, or as directed by a healthcare practitioner. If you are pregnant, nursing, taking any medications, planning any medical procedure or have any medical condition, please consult your healthcare practitioner before taking this product. Keep out of reach of children. Store at room temperature. Do not use if outer bottle seal is missing or damaged. 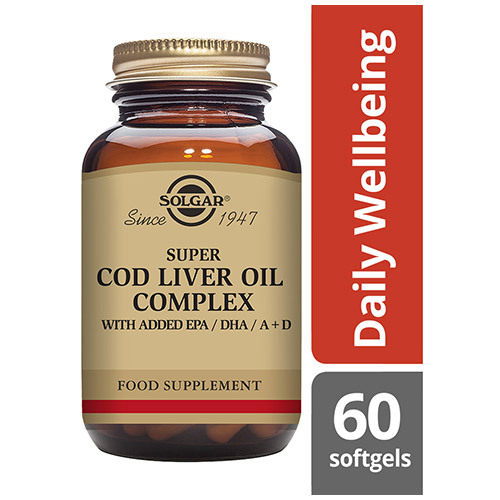 Below are reviews of Solgar Super Cod Liver Oil Complex - 60 Softgels by bodykind customers. If you have tried this product we'd love to hear what you think so please leave a review. 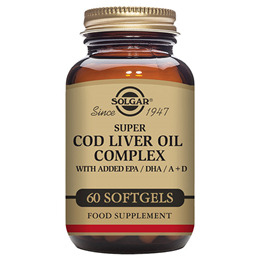 Solgar® Super Cod Liver Oil Complex Softgels is a formula rich in essential fatty acids and Vitamin A and Vitamin D.